Cry a little, sure. 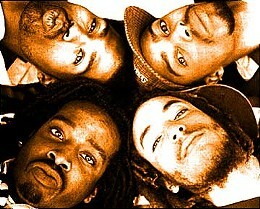 Then smile for The Pharcyde! Talib Kweli has unfortunately cancelled his 2011 Halifax Jazz Festival appearance in Halifax with Idle Warship (link above is to his Twitter feed, scroll down to June 25 for his stellar interactions with pissed off fans). Halifax Jazz Festival, however---ever the lemonade makers---have confirmed The Pharcyde in Idle Warship's place. You happy? I'm happy. If you aren't, contact the Jazz Fest for a refund on your Idle Warship ticket. But, bear in mind, this show will be good stuff.